Ashoka Tree Resort at Tanggayuda Ubud is a boutique resort offering breathtaking beautiful green hills and valley view that can be seen directly from the villa, hotel, restaurant and public pool. Wos river running beneath the property and the rapid river sound can be heard from the restaurant and garden area. 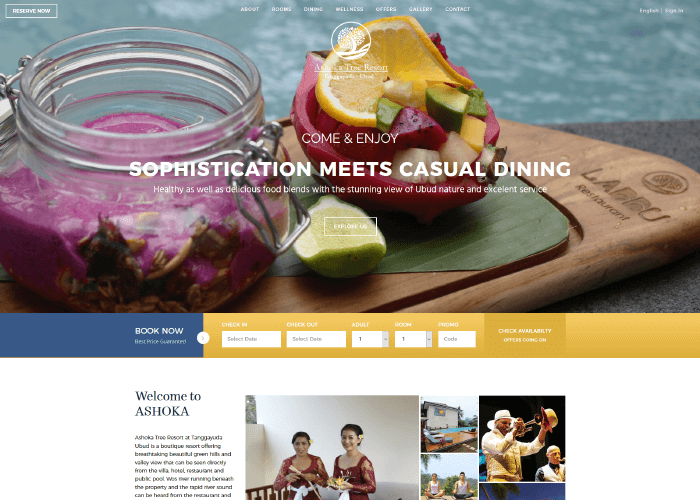 Ashoka Tree Resort at Tanggayuda can be reached within a short minute drives from Ubud centre as a center of culinary, arts, craft and culture of Bali. Our property architectural concept offers privacy, comfort and contemporary design combining modern and traditional Balinese values. Each villa is equipped with a garden, pool, dining room, living room, full kitchenette, spacious bathroom and upper deck for sunbathing, romantic dining or simply relaxing. It is the ideal place for honeymooner and or family looking for a truly romantic atmosphere, comfort, and escape from hustle bustle of daily works. Guests are welcomed with our signature brand of hospitality, personalized service-semi butler and offered several of daily activities such as Yoga, Cooking Class, Cycling, Painting Lesson, Morning Walk and Spa-Massage.